The #1 CNC router information resource. Let this website help you buy, build or simply learn the "ins and outs" of this amazing machine! The popularity of the CNC router is rapidly increasing, from hobbyist to large and small businesses alike. People are always finding new ways to utilize these amazing machines. Maybe you have already decided to make the investment and purchase a CNC router for personal or business use, but would like to know how to select the right broduct for your needs. Many questions arise when shopping for a CNC router. There are literally hundreds of models and features available. Each machine is designed to operate in certain conditions and perform certain tasks. This is where our Buyer's Guide will help you. It will coach you through every step of buying a CNC router. It will cover everything from identifying the right router for your application to discussing pricing and optional features. Looking to Build Your Own? Building a CNC router can be a rewarding experience. It can save you a lot of money and allows you the option of designing and building a machine to fit your need specifically. Not to mention its a lot of fun is a very rewarding and a great learning experience. At this point you may have some idea of your design and how you want to build it. Or maybe you have no idea and are still gathering parts. Either way, you have come to the right place. A complete a breakdown of all the parts you’ll need and their function. It will look at every part of these machines down to the wire, literally. The guide outlines the do’s and don’t and explains some common design flaws in many homemade versions. So maybe you don’t want to buy or build a CNC machine. You may just be looking for some general information on these machines. Well, you’re still at the right place. Here you will find everything from the breakdown of all the types of CNC machines down to their individual parts and how they work, to the software and electronics needed to make them operate. Routers are amazing machines and we want to offer as much information about these machines as possible. So thank you for visiting our site and please bear with us as we update and populate this website daily. If you do not find the information you were looking for, please do not hesitate to contact us with any questions or comments. We will respond as soon as possible. CNC Router Engineering: We'll personally help you throughout the process of your CNC router project. CNC routers Buyer's guide. What you must know before buying. 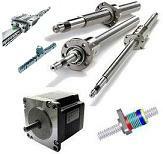 CNC Drive Components: Stepper Motors, Servo Motors, Leadscrews Etc. CNC reviews: routers, parts, and services. We also have reviews on other CNC.. This Blog keeps you up-to-date with all additions and changes to the CNCRouterSource.com Web site. Build, Buy, or Learn about CNC routers. Subscribe here. The CNC wood Router: How does it work? CNC woodworking machine. There is a variety of machines that do CNC woodworking. Lets look at the many types and features. Breakout Boards: What are they? Calculators: In this section you will find a grown source for unique calculators that will help you design and build your CNC machine. The Following Applet will help you estimate the efficiency of a lead screw given the diameter and the lead. So, why exactly is the acme thread form used for lead screws and can any type of thread do the job? Use this applet to help calculate the total deviation of linear position of a nut on a lead or ball screw given the lead, lead accuracy, and distance traveled. Lead accuracy, tolerance, and straightness of acme screws are very important specifications when designing and building a CNC router around acme lead screws. For the CNC router builder or buyer some of the utmost concerns with the ACME lead screw are efficiency and life. Back Lash and Back Driving are both concerns for the CNC router builder. The following section will cover both of these aspects. Acme Lead Screws: Load definitions. It is important to understand the proper way to load the lead screw when building a CNC router. Calculate how much linear force a lead screw or ball screw can produce given the torque of a motor, the lead or ball screw efficiency, and pitch. Selecting a Leadscrew Part 1: The “Must Knows”. There are a few criteria for selecting a leadscrew that should never be overlooked. This section offers links in regards to CNC electronics. It is important to understand the lead screw forces when selecting a screw assembly for a given application. Calculate the forces acting on a lead screw given friction, weight of assembly, desired acceleration, and external forces. This applet will help you find the minimum diameter of a lead screw as it relates to compressive loads and column strength. Required inputs are lead screw span, load to be applied, and end fixity type. The task of selecting lead screws can often be confusing because the many variables involved. The ACME nut is the part that mates with an ACME lead screw. Selecting the right nut for your CNC router system is vital for proper machine function. The Precision ACME Leadscrew nut is an essential component of a quality CNC router. ACME Nuts and lead Screws: Important considerations when choosing lead screws for your CNC router machine.